Leaving on a jet plane! 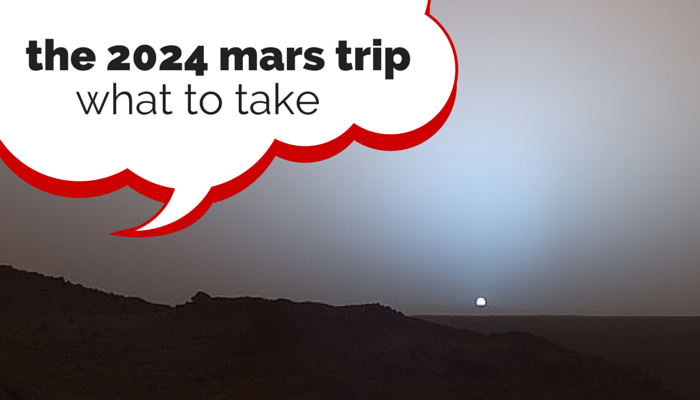 what should the 2024 Mars Mission take with them? ESE Direct > Articles > Leaving on a jet plane! what should the 2024 Mars Mission take with them? It will take 115 days to get to Mars from Earth (I don’t know where else you’d be leaving from) that’s just less than 4 months, for a mission that a handful of brave people that won’t be coming back again. So what should they take with them? We had a flick through our shiny, spanking new 2015 catalogue and we think the following items could very well be useful on that space rock. A clock would be essential, especially on that 3-4 month journey to the red planet, you will definitely want to know how much longer it is until you meet your destination, on the flipside it could induce rage or insanity and be ejected from the shuttle before landing on the moon and being worshipped by the clangers. Once you’ve settled into your surroundings on the red planet you will want to pop out and see what’s about, so make sure you take a vehicle first aid kit for your space buggy! You might need a plaster. So at some point you will probably have to go out and collect rocks as part of the mission, you don’t want to be dragging anything big with you which is where this folding box cart is great, its light weight and folds into a neat suitcase looking contraption when not in use, it’s basically SPACE SAVING (geddit?..Mars..Space, never mind). It can get a bit nippy on Mars with temperatures dropping down to -153 degrees Celsius (short weather in Scotland), so these foil blankets are ideal for retaining that all so precious body heat. Alternatively you could use them to fix the reflectors on a satellite if worst comes to worst. You can find out more about the Mars mission in 2024 on theguardian.com and find out who the shortlisters are.